Marketing copy is just another way of saying, “I love you.” At least it should be. Your target audience doesn’t really care how you got started, where you are (unless you’re business is local), or how many awards you have. How long you’ve been in business and how many awards you have can lend credibility. But no one reads copy looking for those things initially. Today’s impatient, fast-twitch, gotta-have-it-now customers give you very little of their precious time to convince them they should do business with you. Grab them FAST! The currency of conversion on the web or in print consists of only two things: words and images. Use them to speak to your audience, woo them, and promise them that they won’t be sorry for choosing to love you. Use words and images to speak a shorthand that your audience instantly understands. 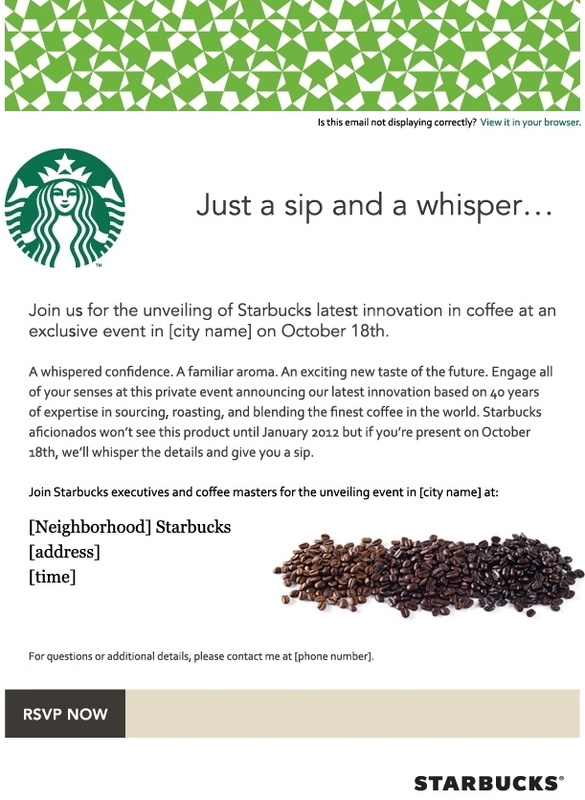 View the Starbucks campaign below and contact me today to get started on your project! The main thrust of the piece below was to engage the readers olfactory memories and, since the event was only open to select media, to evoke the idea of the participants being taken into special confidence.